Morris, William. Poems by the Way. London: Reeves and Turner, 1891. Limited edition: no. 1 of 100 copies. Morris book label. Provenance: Morris. — Charles Fairfax Murray. — Fairfax Murray sale, Christie, 19 March 1918, lot 551 (part). — Charles F. Smith. 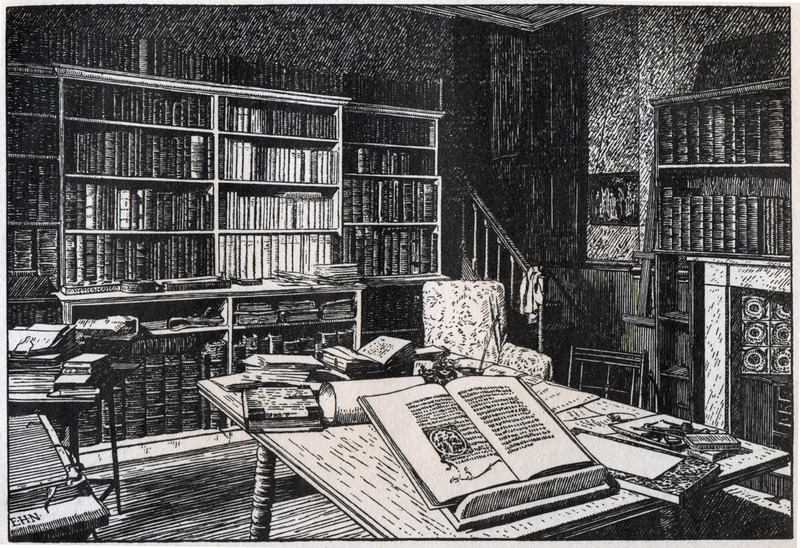 — New Britain Institute Library (gift of Smith). — Quaritch list of new acquisitions (December 2018), no. 11 (£1,250). — Unlocated. Herodotus. Herodoti Halicarnassei Historiographi libri novem. Cologne: Eucharius Cervicornus for Gottfried Hittorp, 10 January 1526. With Morris book label. Shortly after Morris’s death, his executors sold several books privately to Fairfax Murray (who at one time hoped to buy the entire library), and this seems likely to have been one of them, since it does not appear in the 1898 Sotheby catalogue. A further complication is that when it was auctioned in 1917 (see below), the catalogue entry fails to mention Morris, but it is almost certainly the same book, since the binding (half russia) is identical. Provenance: Morris. — Charles Fairfax Murray. — Fairfax Murray sale, Christie, 11 December 1917, lot 212. — Unlocated. Reference: Fairfax Murray Catalogue (German), 1, no. 198. Morris, William, and Eiríkr Magnússon, trans. The saga library. 3 vols. London: Bernard Quaritch, 1891–93. Provenance: Morris. — Jane Morris (?). — May Morris. — Mary Lobb. — Lobb sale 2, no. 486 (sold for £3 5s.). — Unlocated. La Motte-Fouqué, Friedrich Heinrich Karl, Freiherr de. Romantic fiction: shorter tales from the German. 2nd ed. London: Edward Lumley, [1843?]. Provenance: Dante Gabriel Rossetti. — May Morris. — John Bryson. — Ian Hodgkins and Co. (purchased at Bryson sale, Christie, London). — Mark Samuels Lasner. — Mark Samuels Lasner Collection, University of Delaware. Morris, William. Manuscript notebook, chiefly notes on books in British Museum. Reference: MS catalogue (2), no. 6. Large paper; presentation copy from Morris to unidentified recipient (probably Jane Morris), in a binding designed by Elizabeth Burden (Jane’s sister) and executed by T. J. Cobden-Sanderson. Two pages of the book are decorated by Morris. Provenance: Morris. — Jane Morris (?). — May Morris. — Mary Lobb. — Lobb sale 2, lot 471 (perhaps sold for £22; in the British Library copy of the catalogue, the lot is marked both “Sell” and “Keep”). — Unlocated. Boedhvarsson, Arni. Riimur af Ingvari Viidfaurla og Sveini Syni Hans. [Iceland:] Hrappsey, 1777. Reference: MS catalogue (2), no. 50. In a binding designed by Philip Webb..
Reference: MS catalogue (2), no. 250. Morris, William, trans. Aeneids of Virgil. 2 vols. London: Ellis & White, 1876. References: LeMire, p. 65. — MS catalogue (2), no. 175. Duns Scotus, John [Johannes]. Quaestiones selectae abbreviatae et ordinatae per alphabetum super quattuor libris Sententiarum Petri Lombardi Quodlibetisque Metaphysicae et De Anima. Ed. Johann, von Köln [Johannes de Colonia]. [Venice]: Vindelinus de Spira, [c. 1477]. References: ISTC (id00384000). — MS catalogue (2), no. 802 (with two X’s next to the title). Morris, William. The earthly paradise. 10 vols. London: Ellis and Green, 1872. “Popular Edition. In ten parts.” An incomplete set: includes parts 3, 4, 5, 6, 10. Reference: MS catalogue (2), no. 260. Lemprière, John. Biblioteca classica, or a classical dictionary containing a full account of all the proper names mentioned in ancient authors, with tables of coins, weights and measures in use among the Greeks and Romans. London: T. & J. Allman, 1825. MS catalogue (2) does not identify the date of this book, which went through many editions. Reference: MS catalogue (2), no. 294. Morris, William. The life and death of Jason: a poem. 7th ed. London: Ellis and White, 1877. Reference: MS catalogue (2), no. 263. Sturluson, Snorri. Sagan af Agli Skallagrímssyni. Ed. Jón Þorkelsson. Reykjavík: Einar Þórðarson, 1856. Reference: MS catalogue (2), no. 274. Reference: MS catalogue (2), no. 271. Bulteau, Marcel Joseph. Description de la cathédrale de Chartres. Chartres: Garnier and others, 1850. Reference: MS catalogue (2), no. 149.